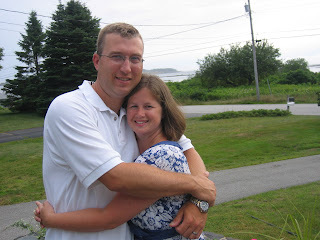 Saturday Doug and I went out on a date. We headed into the Old Port for drinks at a couple different bars and then headed to the Good Table for a great dinner and a pitcher of Sangria. This afternoon we all took a walk. This is about 3:30 today. It is VERY foggy. 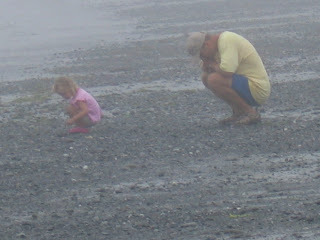 Daddy and Aubrey are looking for sea glass. 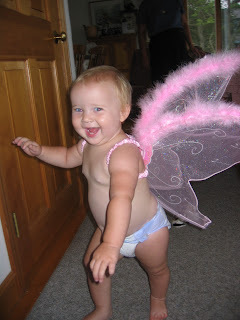 Aubrey thought Molly should wear the butterful wings and Molly loved it! She flew all over the house! 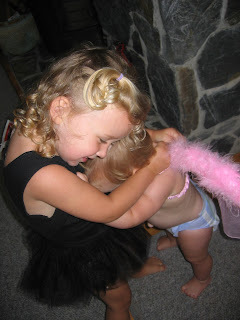 I was trying to take the picture of Molly and Aubrey gave Molly a spontaneous hug. Very sweet.